This page includes The Club News columns from the 2001 issues of Across the Fence Post. The Milwaukee Philatelic Society's annual spring bourse, STAMPFEST, will be held March 3-4 at St. Aloysius Gonzaga Hall, 1435 So. 92nd St., in West Allis. This year's event features 25 dealers from throughout the Mid-west. MPS is also offering 50 door prizes. For further details, see this issue's back-page ad. MILCOPEX '01 HOSTS EIRE PHILATELIC ASSOCIATION MILCOPEX 'O1 will devote 1,000 pages of its 2,500-page exhibition to Irish philately. Other plans include a 30-dealer bourse, a United Nations Postal Administration booth, and a U.S. Postal Service substation. 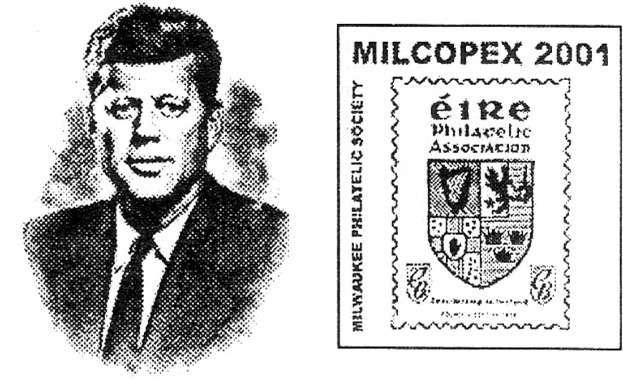 The Milwaukee Philatelic Society sponsors Wisconsin’s only annual national-level show. The 2001 event will be held September 14-16 at the Family Living Center Building, located within the Wisconsin State Fair Park complex in West Allis. For an exhibit prospectus and entry form, write to: MPS, Box 1980, Milwaukee, WI 53201-1980. Bourse applications are available from: John Fagan, W140 N7470 Lilly Rd., Menomonee Falls, WI 53051, 262-251-0617. Co-hosts of a special unveiling of the upcoming Diabetes Awareness stamp are the American Diabetes Association and three Wisconsin post offices: Milwaukee, Madison, and Green Bay. Events will be held in all three cities at 10 a.m. on Tuesday, March 27, 2001. For further details, contact the host cities' main post offices or your local ADA office. A printed program, a special cancel, and possibly a cacheted cover will be available at the ceremonies. The Northwoods Philatelic Society (Rhinelander) now meets at the Masonic Temple, 23 E. Davenport St., in Rhinelander. Meetings are held twice a month at 7 p.m. on the second and fourth Tuesdays. 11 a.m. to noon, and 4 p.m. to closing. Milwaukee-area clubs will hold their 15th annual Distinguished Philatelist Appreciation Dinner on March 18, 2001. This year's honoree is Kurt Albrecht, member of the Milwaukee and the Waukesha County philatelic societies. Kurt will be honored for visibly and repeatedly demonstrating an interest in stamp collecting as well as working to develop interest and enjoyment of the hobby for others. The North Shore Philatelic Society of Milwaukee, with Linda Brothen chairing the Advisory Committee, hosts the 2001 event. On May 5, delegates at the 2001 Annual Business Meeting voted to induct Bill Otto and Thomas Sanford into the Wisconsin Philatelic Hall of Fame. Bill needs no introduction to stamp collectors in the Milwaukee area as he holds member- ship in nearly all clubs within the city and surrounding communities. He furthermore is extremely active in all of them. To quote from his nomination that came from the North Shore Philatelic Society of Milwaukee, "When Bill gets involved in a project, you can bet that his guidance and leadership will ensure that the endeavor will be successful." Tom, of Wisconsin Rapids, WI, is a member of the Central Wisconsin Stamp Club. His philatelic achievements have gained him recognition as the preeminent national authority on Wisconsin precancels and Belgium precancels. Tom has successfully exhibited his precancel collections. He also has written and edited several precancel publications. One of Tom's many articles on the subject appears in the March 2000 issue of ATFP. On June 21, Earl Button joined the JSC's Hall of Fame. The honor was instituted in 1996 to recognize members for outstanding service to the club and efforts in promoting philately. Earl is the 7SC's current president. 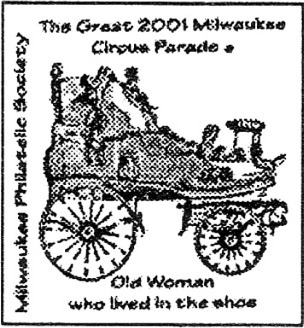 The Old Woman Who Lived in the Shoe circus wagon is featured on the multicolored cachet of MPS's 2001 circus parade covers. Covers were prepared for four days of the parade celebration and include a pictorial cancel featuring footprints. The celebration was held July 11-15 at Milwaukee's lakefront Veterans Park show grounds. MPS has issued circus parade covers for each year 1971-73 and 1985-2001. Cost of the 2001 cover is $2 each or $b for a set of four. Send orders to: MPS Circus Covers, P.O. Box 1980, Milwaukee, WI 53201-1980. Make checks payable to MPS and include a No. 10 SASE. 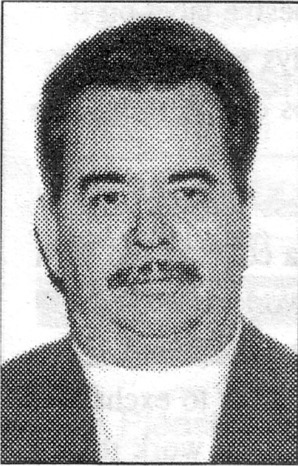 Carl Sandine received the KSCS's 2000 Jack Larsen Memorial Award. The award honors the club's member of the year and was presented at the group's annual May banquet. MILCOPEX '0l, sponsored by the Milwaukee Philatelic Society, was held September 14-16 at State Fair Park in West Allis. Despite the lack of airline transportation due to the terrorist attack of September 11, dealers and judges were able to make it to the show. Unfortunately, though, the planned meeting of the Eire Philatelic Association had to be canceled. 2nd - Early Postmaster Cancels of Wausau, by Wm. Grosnick Sr.
3rd - Airplane Cancels, by Paul Nelson Melanie Tlusty, WVPS youth member, won the award for the most popular exhibit. Her exhibit is titled Horses Appearing on U.S. Commemorative Stamps, 1893-2000. The Milwaukee Philatelic Society is offering its limited remaining supply of Bureau of Engraving and Printing souvenir cards specially produced for MILCOPEX 'O1 banquet attendees. The vignette features President John F. Kennedy. A set of three show covers saluting Irish philately also is available. For mail order details, contact: NIPS, P.O. Box 1980, Milwaukee, WI 53201-1980.